I have said over and over that I will review anything that anyone sends me. And it's true, because it's almost always a win-win for me. If they're really fun games, I get to play really fun games, which is great all by itself. If they're mediocre games, well, at least I have review fodder and something I can trade for something I might actually enjoy. And if they're just plain awful - well, then I get to tell you how much they're like ugly babies that should have been left to die, and that is just plain fun (not leaving babies to die - that would be horrible, unless they were little lizard babies and ate mice and stuff like that show where the aliens come to the world pretending to be peaceful and end up trying to eat everybody). 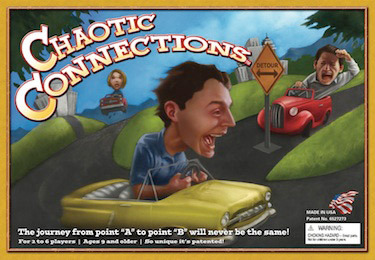 One example of a game that will be much more fun to review than it was to play is Chaotic Connections. It really should be subtitled, 'Ticket to Slide Down Chutes and Ladders,' but I don't think that would have sold many copies. It's a game with a map of the United States and you have to build track - er, build connections between all these major cities. You do this by playing cards that say stuff like 'put down some ugly cardboard squares and pretend they mean you actually drove your car through Arizona.' No, they don't say that. That would just be silly. Obviously, I am paraphrasing. Chaotic Connections is an example of a game created by someone who A) doesn't play very many games, and B) has no idea what they're doing. These people parted with an ungodly amount of money to hire a patent attorney (the game is patented - I am not making that up) and a PR firm (the people who sent me the game) and yet decided to save a couple bucks on the art by using clip art that probably came with their copy of Windows 98. They didn't have the sense to hire a professional graphic designer or a talented illustrator. It kind of looks like they did the art themselves, using a Rand McNally atlas and the drawing tool in PowerPoint. It is impossible not to have misgivings about a game when you look at the box and think, 'this looks like a junior-high art class project.' And when you see the poorly perforated cardboard squares, the intensely cheap generic pawns and the little plastic holders used by anyone who puts cardboard standups in their games, it seems like a foregone conclusion that the game is just plain horrible. And this is one time where you would be perfectly safe judging a book by its cover (incidentally, there are also many books that you can accurately judge by their covers, making this one of the least meaningful phrases ever employed, right behind 'it is what it is' and 'elegant mechanics'). Chaotic Connections is, quite predictably, crap. There is virtually no strategy or tactical thinking involved in playing this game. You set up the game by getting yourself four cities that you have to connect. You can connect your cities using your opponents' roads, which is nice, because otherwise the game would take an unbearable amount of time. As it is, you can finish rather quickly, making the game more like having sand in your underpants, rather than live lobsters. Your turn consists of drawing a card and then playing one of the four you're holding. About a third of the cards tell you that you must play them regardless of whether you want to use them, rendering your decision-making process about as relevant as that of a mollusk with a tennis racket. If the cards were somehow interesting, and the best possible card not immediately obvious to anyone with an IQ high enough to prevent their drooling into their sippy cups, there may have been something here worth playing. But the cards are not interesting, and even a brain-damaged badger could tell which card to play, so it's just plain dumb. You'll spend ten minutes going through the motions of playing cards and placing chits in their most obvious locations, and then you'll realize that you hate the game enough to help anyone win if it will make the damned thing go away. I would worry that someone with multiple brain cells would actually purchase a copy of Chaotic Connections, but given the ridiculous art and pathetic attempts at production value, no game nerd with any amount of common sense would invest good money in this horrible game. This is not some public service where I warn potential game geeks of the dangers found within the box. This is one of those cases where just about anyone can take one glance and know without a doubt that they would be better served spending their money on pre-scratched losing lottery tickets. If you want to have fun playing a game, try - well, try anything else at all. Why on Earth anyone would think they were going to turn a profit with a game this horrible is a mystery to me. Suffice to say that you should not reward this poor judgment with your money. The sentence about the braindamaged badger made me laugh (I tend to visualise everything I read). Keep up the good work. Favorite line..."making the game more like having sand in your underpants, rather than live lobsters". Thanks for that image!